GAME CHANGER - The Americans .US! Understanding the whole of Army acquisition is exceedingly difficult, and that’s why ARDEC—to change its culture, improve decision-making and unleash its own agility—created an innovative combination of war gaming and business architecture. In doing so, it has created a blueprint for the rest of the Army, and DOD. Sometimes the best way to learn something is to do it. A bunch of GPS coordinates is just a bunch of numbers. Plug them into a geographical information system, like Google Earth, and suddenly those numbers come alive as a real, concrete place. That, in effect, is what the U.S. Army Armament Research, Development and Engineering Center (ARDEC) set out to do recently when it created a war game that used its business architecture. The war game itself was something of a ruse, in the same way that high school robotics competitions are, on the surface, about robots, but the real intent is creatively teaching math, engineering, computer programming and teamwork. Similarly, ARDEC’s business architecture war game pitted two teams against each other to compete for an engineering services contract. But it wasn’t really about engineering services. It was an educational tool to turn the dull abstraction that is “business architecture” into something concrete that users could see and interact with as they competed for bragging rights in the game. In creating the war game, ARDEC created a reusable tool that not only educates its workforce in business architecture, but also facilitates and improves any organizational decision at any level, including strategic decisions involving budget and planning, and even potential mergers and acquisitions. A common framework for understanding what an organization does and why, making it possible to think about the organization in a holistic way, and to prepare for new projects efficiently. For large organizations facing changes to the external environment—like ARDEC—this framework for thinking helps reduce risk and keep the organization on track. Business architecture forms a standardized framework that enables an organization to comprehensively classify what it does, or what its capabilities are, through the creation of a common vocabulary, allowing any employee to view the organization through a common lens. That’s important because each organization within the Army acquisition enterprise must balance its physical, financial, intellectual or human resources with its limitations. The problem with business architecture is that it is complex and sounds about as exciting as watching grass grow. But for those who understand it, business architecture is a powerful tool and just the thing that Army organizations must have to best support the Army’s needs as it continues to modernize. For ARDEC, it became a way for leadership to continue challenging conventional thinking about how a public sector organization should operate to begin a real culture change. The combination of business architecture and war gaming bridges disparate but complementary perspectives to accomplish just that. Business architecture aims to provide a holistic view of an organization—its policies, strategies and products—yielding important insight into capabilities, end-to-end value delivery and information. War gaming turned the abstract into something tangible and urgent that employees could use and interact with. The model we developed at ARDEC can be adapted to any DOD organization. A mission model helps an organization begin to understand what capabilities it should have to carry out its functions. The mission model adapts the principles of the “business model canvas,” a mapping strategy for commercial enterprises, to nonprofit organizations like the Army. ARDEC’s process for the mission model canvas was inspired by Steve Blank. FIRST, WHY DO WE EXIST? Think of Lego bricks labeled with a variety of capabilities, such as customer management, portfolio management or program management. Business architecture is made up of Lego bins that tell you which Lego bricks you have to play with, what those capability blocks can do, and who else is using them. Business architecture has several parts. If an organization is just starting to develop a business architecture, it’s best to begin with a mission model (if the organization doesn’t have one), followed by the capability map. 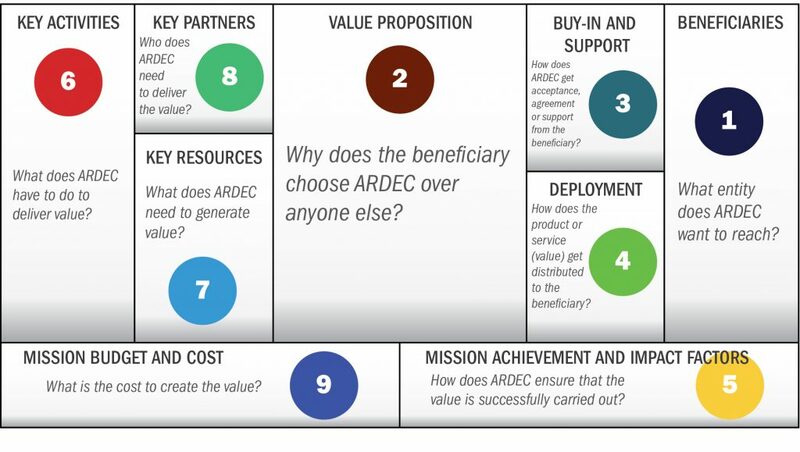 The mission model lays out who ARDEC’s customers are and asks what ARDEC needs to do to provide value to each customer. So we ask, for example, “What does ARDEC have to do to deliver value?” An answer might be that we have to manage science and technology (S&T) projects. Our mission model will have a whole list of activities we need to accomplish to do that, and we can use it to generate the list of Lego bricks that exist to accomplish those tasks. “Managing S&T projects” is a key activity that might lead us to identify capabilities such as “project performance management” and “project risk management.” Those capabilities are the building blocks to help develop plans that meet objectives to achieve our mission. A capability map is like a blueprint that represents bins of Lego bricks that the organization uses to organize its capabilities. Each item in the capability map is a Lego brick that represents something ARDEC does, or is capable of doing, to build projects and make decisions. While business architecture should be used for any decision in the organization, for our purposes, each project that ARDEC undertakes is a Lego house. Let’s say I’m a project manager who needs to construct a Lego house. I’ll look in the Lego bin to see if I have enough pieces, and see if the pieces are the right size and color. Similarly, ARDEC needs to make sure it has the right organizational pieces, or capabilities, to achieve its strategy. THIRD, HOW DO WE DO IT? Let’s say I need to build a new roof for one of my Lego houses. First, I’d need to make sure that I have not only the capability (roof management), but also the capacity. Is someone else using those bricks? Do I need to hire more people skilled in roof management? We have the same type of strategic discussions in our organizations. If we have multiple projects that require the same capabilities—maybe we’re working on three different artillery systems that all require modeling and simulation—we need to discuss whether we should outsource, hire more people or hold off doing the project. Business architecture is a great tool for analyzing risk and foreseeing resource issues rather than responding to them after they arise. WHAT CAPACITY DO WE HAVE? When I joined the Army team 12 years ago as a computer scientist, I quickly became frustrated by the lack of clear business rules. Army policies can be purposefully vague, leaving it up to the lower levels of the organization to determine how they want to implement them. That may work fine in some instances, but in large organizations that need to think and operate strategically as an enterprise, that vagueness can result in data that varies from group to group, making it hard to consume. When data can’t be consumed easily, it might as well be garbage. In an effort to clear up the vagueness, we looked at several disciplines known for organizing “enterprise,” or big-picture, information, such as enterprise architecture, systems engineering and business architecture. We found that they shared architectural principles, such as designing for purpose and aligning efforts toward a common goal. However, they all had a similar problem: They all created two-dimensional pictures. The only way to show business architecture’s value was to add a third dimension to make it tangible. Realizing that I needed to find a creative way to explain the value of building the architecture and promoting its value, I began a personalized outreach initiative across the organization. Twenty-two employees attended three days of business architecture classes because they became convinced of its value, not because it was required training. They spent the summer of 2017 in weekly three-hour workshops that I created and facilitated to generate the mission model and Levels 1 and 2 of the ARDEC capability map. Although the capability map we created in those workshops is intriguing, managers still had difficulty visualizing how ARDEC could actually make business architecture work. How could I help them realize the value? I had to disrupt the way people thought about strategic planning. In a frenzied brainstorming session, we came up with a revolutionary idea: Business Architecture: The War Game. Two teams of ARDEC employees played the game for three days. On the final day of the game, the Tiger Team was declared the winner over Skunk Works. We held an after-action review with all of the participants and made clear the real purpose of the game. Most of the participants knew little or nothing about business architecture, and that was the point. We used the war game to drive home the message that business architecture can help make decisions at all levels of the organization. War game participant Kevin Hayes, deputy director in the Enterprise and Systems Integration Center, observed that “business architecture can be used to support annual budget planning as it provides the ability to quickly see where weak areas of the organization are and make better investment trade-off decisions.” Managers can act in the role of the market team, determining which capabilities are necessary for investment. Just as, in the game, the budget proposal will contain capability investments and justifications. Managers, or higher-level organizations, now have data helping to drive decisions and support an enlightened strategic discussion. 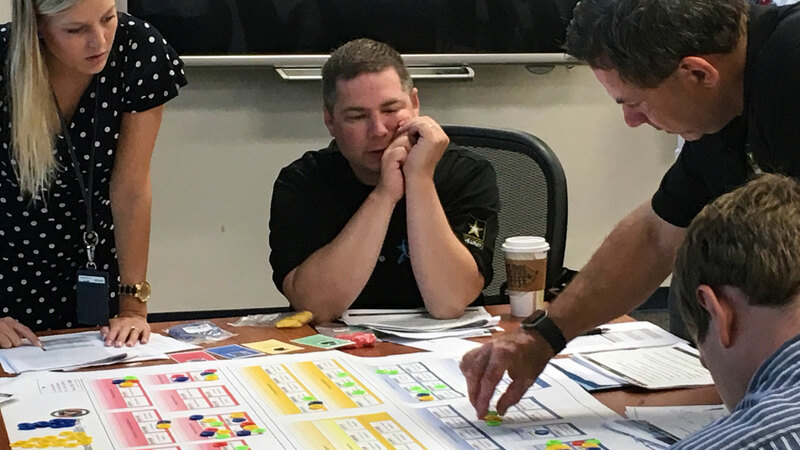 Katherine Guarini and Dave Magidson, John Finno, and Rob Hendrickson study the war game created to help ARDEC understand the value of business architecture—itself a valuable tool for understanding what an organization is capable of, and how to manage those resources. The business architecture war game is a powerful tool that can be used for any significant strategic undertaking that is fraught with uncertainty. As a planning tool, it raises the visibility of the make-or-break uncertainties that are sure to be common in modernizing the Army. The acquisition enterprise is so complex in its vast number of capabilities that it takes a tool like this to make it comprehensible to those who know only their little corner of it. With a task as monumental as modernizing the Army—the largest service branch of the world’s largest bureaucracy—the ability to visualize organizations as a whole, and understand what they are capable of, matters more than ever. I’m determined to show that business architecture can enable ARDEC—or any organization—to do a better job of looking at our capacity to execute our mission as the external environment changes. These changes might include budget cuts, hiring freezes and new requirements. ARDEC, through its use of business architecture, is ensuring adaptability and flexibility to meet the challenges required to develop the future force. This model can be used by any Army organization—indeed, DOD itself—to think in a more holistic way and to promote organizational learning and continuous improvement. As we continue to find new opportunities to apply business architecture concepts to improve our planning and execution of the armament research, development and engineering mission, ARDEC will remain relentlessly focused on developing the world’s best armament and munition systems for the warfighter. PLAN IV. BETTER PLANNING III.II.I...JUST ADD WATER!